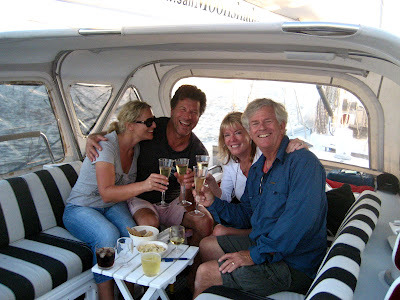 It is oftens said that the two happiest days of a boatowner’s life are the day they buy a boat and the day they sell a boat. The photo below shows a celebration of both! Four very happy sailors are celebrating the sale of Moonshadow to her new owners Deb and John Rogers on Tuesday March 27 in Jacksonville Florida. John grew up in San Diego in a sailing family that includes the likes of Dennis Conner. Deb started her sailing career on her first date with John aboard a sail boat in Coronado Bay. For 39 years they have owned various yachts and dreamed about spending their retirement living aboard and cruising. We are all delighted that they chose Moonshadow to be their new home. We couldn’t be more pleased that Deb and John will be looking after Moonshadow and continuing the adventures which she is so well suited for. They invite you to follow their advenures on www.saillegacy.com. As for us, we are definitely not hanging up our sailing gloves and have plans for some different types of boating and travel. Watch this space! This entry was posted in All Cruising Logs, Atlantic Ocean Logs. Bookmark the permalink.